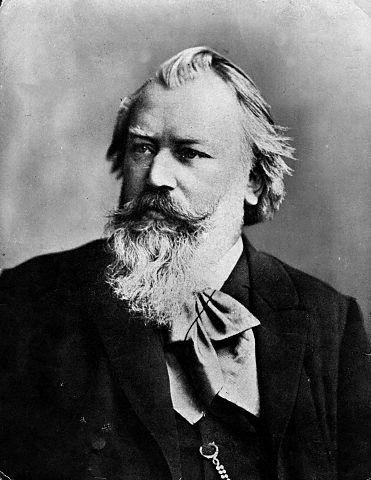 Johannes Brahms was a German composer of the Romantic period. He lived from 1833-1897 and was born in Hamburg. When young Johannes Brahms was introduced to Franz Liszt at a friendly gathering, he was so nervous that he declined to play. Liszt kindly collected the young composer's scherzo from a table and played it with such proficiency (while simultaneously critiquing the composition) that Brahms himself was quite amazed. Some time later, Liszt was asked to play one of his own sonatas, a recent work of which he was particularly fond. As he came to the most expressive portion of the piece, he gazed around to see whether it was having the desired emotional impact on his listeners - and was surprised to find Brahms soundly dozing in his chair. One day in his twilight years, Johannes Brahms announced his plan to stop composing music and enjoy whatever time he had left. After some time without writing a note, Brahms buckled and produced a composition. "I thought you weren't going to write any more," a friend remarked. "I wasn't," Brahms replied, "but after a few days away from it, I was so delighted by the thought of not writing that the music came to me without effort!" Johannes Brahms once found himself cornered by a group of talkative female admirers. Having made several unsuccessful attempts to escape, the composer finally lit an enormous cigar. The ladies, engulfed in smoke, chided the composer for this boorish manner. "A gentleman," they declared, "does not smoke in the presence of ladies." "Ladies," Brahms retorted, puffing away, "where there are angels there must also be clouds." Johannes Brahms could be insufferably sarcastic and rude - even to his friends. On one occasion, after he had upset several people with a series of offensive remarks, Brahms rose to his feet and, preparing to leave the room, paused briefly at the door. "If there is anyone here whom I have not insulted," he said, turning, "I beg his pardon!" Johannes Brahms was not without his critics. Philip Hale, for example, once suggested that the inscription above each door at Boston Symphony Hall be altered to read: EXIT IN CASE OF BRAHMS. Johannes Brahms was once invited to dinner by a noted wine connoisseur. In the composer's honor, the man opened one of his finest bottles. "This," he announced to his assorted guests, "is the Brahms of my cellar." Brahms nodded, carefully examining the wine - inhaling its bouquet, swirling it in his glass, and holding it up to the light - before setting it down without further comment. "How do you like it?" the host asked with anticipation. "Well," Brahms replied, "better bring out your Beethoven."